Teak cleaning is normally a problem that is often solved by drastic methods such as sanding or the use of powder or extremely caustic detergents which will eventually severely damage the surface. 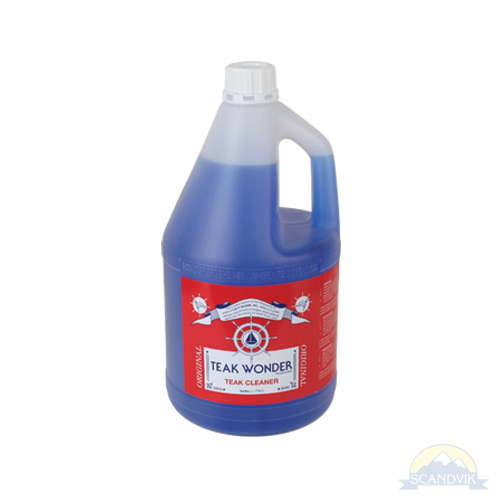 TEAK WONDER® CLEANER is a powerful cleanser that thoroughly cleans the teak easily and with very little effort, without the need for sanding. The product is neither caustic nor aggressive and will not damage rubber seals, paint or hardware. The grey oxidation and dirt are removed in a few minutes. The cleaning process is carried out by wetting the surface to be cleaned thoroughly with fresh water, then apply the cleanser evenly and brush the deck with a soft bristle brush, across the grain (do not apply too much pressure, this avoids damaging the teak fibers). Rinse the soapy solution off with plenty of fresh water and do not allow the wood to dry prior to starting the brightening process. On heavily soiled surfaces, which have significant oxidation or have not been cleaned for a long time, a second cleaning may be necessary before starting the brightening process. Carefully wash away any product left on non teak surfaces.